How can I add team members/collaborators to that they can also profile and test? Enabling several developers to profile the same applications/on the same servers requires a Premium or an Enterprise Edition subscription. You can try the Premium Edition for free for 15 days. Collaboration happens through Blackfire environments. First, create an environment. You will need to navigate to the Organization which has the Premium or Enterprise subscription. Go to the "Settings" tab of each environment you created to add members. Please make sure to use their existing account's email address to add them to the environment. If the email address you entered doesn't correspond to an existing account, your collaborator will need to create a new account. 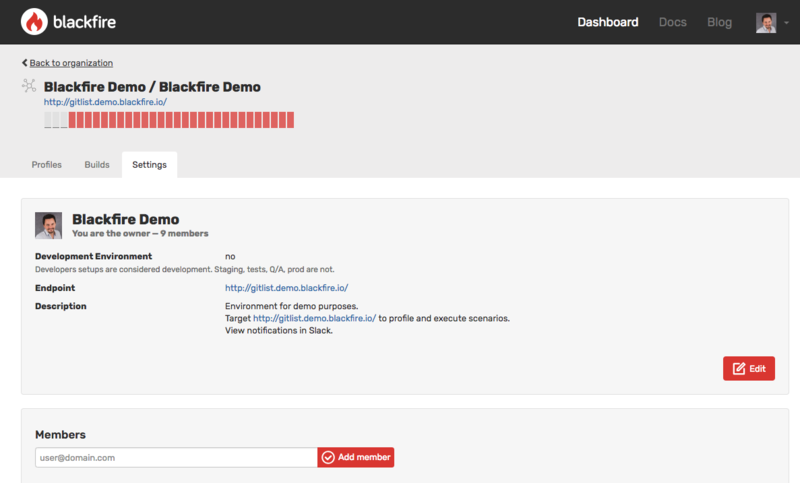 The easiest is then to create and account on SymfonyConnect with the selected email address, then signup to Blackfire. Environment admins enable the account owner to delegate some rights to a team member.